In Psalm 1, we have the beginning of a beautiful formula, a theological concoction that has intoxicated God seekers for thousands of years. Understand God’s will and live according to it, and you will find joy, prospering in all you do. Ignore God’s will, and life will be misery and loss. It is the classic theme of Wisdom literature from the Near East. nor in the session of scoffers has sat. One chooses where to walk, or with whom to stand or sit. The metaphor then shifts to something very familiar for people raised in an arid climate, the image of fruit trees in need of water. Plant yourself in God’s law, the revelation of God’s will, the Psalm is saying, and like a tree near an always-flowing stream, you will bear fruit. Plant yourself too far from the source of life, and you will wither until dry and blow away. On the surface, these are beautiful ideas, concepts that fit our desire for justice. Without further development, they can seem quite empty to us, though. If the opening theme of Psalm 1 were the only theme of Scripture, I would have long ago discarded my study of the Bible. The idea being expressed does not match the reality of what we observe during most of our lifetimes. Too often, the clearly good people suffer. Too often, it is the wicked who flourish and seem to have all the fruit. Fortunately, Psalm 1 is just one piece of an elaborate puzzle. The Book of Job is an equally ancient piece of Wisdom literature, and it takes us in a whole different direction. You may remember the story of Job. As it begins, he fits the pattern described in Psalm 1. He is a righteous man, walking with God and prospering mightily in terms of family and wealth. The problem arises when Satan goes to God and speculates that Job is righteous simply because life is so good for him. Let me strike at him, Satan says, and Job will curse you, God. First, Satan is allowed to strike Job’s possessions and family. Later he’s allowed to strike at Job himself, afflicting him with terrible diseases. In all of this, Job does not curse God, and he does not relent in his assertion to friends that he has done nothing wrong. He does complain mightily at times, though, and once he begins, he moves beyond his own problems and complains about how the wicked flourish and abuse the righteous, including orphans and widows, and God seems to do nothing. You reach a story like Job’s in Scripture, and you realize the Bible deals with some very deep subjects. We may not find satisfying answers in Job to these deep questions about evil’s persistence, but at least the questions are asked. So, with its simple opening formula, is Psalm 1 irrelevant? No, not at all. Its theme is a beginning point for us to think theologically. If you teach a child something, you have to begin in a simple place. There is good, and good is what we must pursue. There is evil, and evil must be avoided. The later, more complicated questions we ask as we mature do not change how the early, simple lessons need to be structured. And as our spiritual understanding grows and matures, the Bible is there for us every step of the way. This is why it is so important for us to engage with the Bible continually throughout our lives. If we hear what seem like simple stories and lessons as children, and never return to the Bible as we experience more and more of life, we will think Scripture is irrelevant. And in the process, we miss so much that is useful as we continue to live. When Jesus arrives on the scene in the grand narrative of Scripture, his teachings seem designed to take us deeper while also simultaneously emphasizing the early truths we learn. Parables are a good example. Jesus teaches in parables to perplex us until we ponder for awhile, and in pondering we discover powerful new truths. Through Jesus―God among us, Immanuel―we learn that God loves us in ways the Jews had scarcely imagined. God pours out on the world what seems, from our perspective, to be this most illogical love, a love unearned and undeserved. At the same time, Jesus teaches us to never let go of what we learned from the start. We are to come to God with the faith of a child, trusting that the basic lessons found in places like Psalm 1 really are true. Yes, in the end, righteous, good people really do prosper; in the end, wicked sinners have nothing but failure and loss. You heard me say “in the end” twice there, of course. So often, answering our difficult theological questions simply is a matter of perspective. We are confused because in our grief, in our pain, we have trouble with the bigger picture, which again, Scripture provides. If you’re paying close attention, even Psalm 1 alone offers that bigger picture. As the psalm ends, the wicked and the righteous get their just deserts at the judgment, rather than right away. The path of the righteous may seem difficult, at times, but it is well-guarded. God ensures it leads to eternity with him. We are blessed to know Job’s Redeemer as Jesus Christ. Knowing Jesus and believing in Jesus, we will have both justice and joy, neither of which will ever depart from our lives for all eternity. We are making a major shift in Romans as we reach the fifth chapter. By this point, Paul feels he has clearly established that faith in Christ’s work on the cross is all we need for salvation. Believe, and we are made right with God. Peace. Paul’s notion of peace is what I would call beautifully complicated. At times, Paul uses “peace” as if he means the cessation of hostilities. In other words, we have been at war with God because of our sinful natures, but through faith in Christ’s work, hostilities end. “Peace” also represents what we receive from this reconciliation: a constant sense of well-being, an understanding there is nothing to fear. Joy and Rejoicing. We are so assured by the Holy Spirit of the truth about our salvation that our basic way of experiencing life is changed. We are lifted up in a way that is hard to describe until it has been experienced. Endurance and hope. Yes, suffering continues to be a part of our lives, but we are changed so we can endure what others might find unbearable. We talked about this some last week as I asked you to think about the future. Paul pulls no punches. Life can be hard, and we should expect difficulties to arise. But filled with the assurance the Holy Spirit has given us, we know what lies ahead, and we can plow through life without losing our ability to rejoice. Palm Sunday is a special day in the life of the church, and I want to focus on a timely thought in our passage. “When we were utterly helpless, Christ came at just the right time for us sinners.” Today we celebrate the image of Christ coming for us, riding into Jerusalem to save us in a most unexpected way. We hear the story of this timely arrival told in slightly different ways in all four gospels, in Matthew 21:1-11, Mark 11:1-11, Luke 19:28-40, and John 12:12-19. In short, Jesus rides a donkey into the city as a prophetic act, and the Jews who have packed the city for the Passover cheer him like a king as he enters. “Hosanna!” they cry in a cheer of praise. They didn’t really understand what they were seeing. They were in the right place at the right time, but they cheered for shortsighted reasons. Most of them assumed Jesus had the potential to overthrow the political system and establish himself as an independent Jewish king, restoring the Jewish people to their former glory. In less than a week, many of these same people would take up the cry, “Crucify him!” They would see Jesus as a failure, another rebellious wanna-be king crushed by the people in power. As big as their dreams had been, they could not see the incredibly big picture of what Jesus, truly the Christ, their promised Messiah, was doing. When we read the story of the “Triumphal Entry,” it looks like a joyous scene, but it is actually a sad scene to contemplate. Of all the people who had ever lived and will ever live, the people gathered in Jerusalem were the privileged few allowed to be present at the pivot point of history. Remember the promise made to Abraham thousands of years earlier—these Jews were to result in a blessing that would impact every family on the earth. Jesus was on his way to make that blessing possible. All of us who have walked through Holy Week with Jesus in past years know what is coming. Jesus offers some of his most intense and disturbing teachings to his followers, to the point where most abandon him. His conflict with the Jewish leaders grows and grows until they determine they must get rid of him. And, working with the Roman Empire, they do—but not for long. We will talk more about the “not for long” next week, of course, on Easter Sunday. Let’s stay focused right now on the work Jesus arrives to do in Jerusalem. Paul is telling us that Jesus’ life and ministry, in particular the moment Jesus died on the cross to make it all effective, happened “at just the right time.” As time has passed, Paul’s meaning has become more and more self-evident. 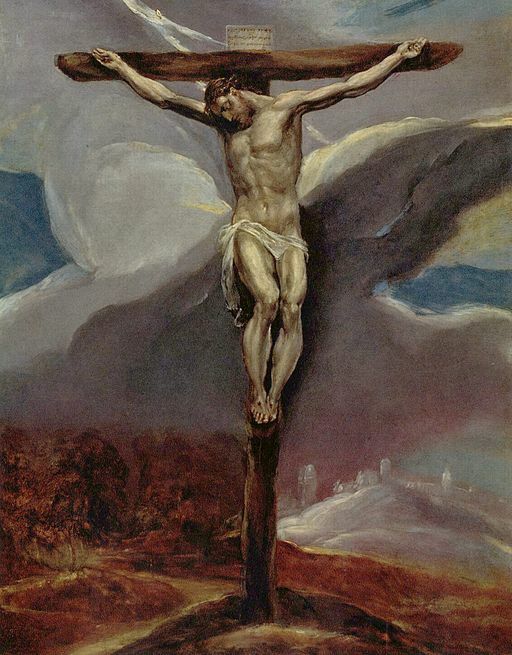 Think about the time and place Jesus was crucified. What’s miraculous is that we ever heard about it at all. From a human perspective, if you wanted to plan a martyrdom to change the world, the last place you would start would be through the crucifixion of a backwater rabble-rouser who had lost most of his following, to the point that only a tiny remnant showed up at his execution. From God’s perspective, though, this was the golden moment for the divine sacrifice to atone for all sin. Over nearly two millennia, it has proven to be golden. What an astonishing thing to consider; by our time in history, we can see how word of this obscure crucifixion and what follows has spread globally, touching nearly every culture on the planet! Yes, God controls the big picture in ways we cannot see. And here’s some more good news: We’re part of that picture. And as tiny a part of it as we are, God’s perfect timing also is at work in our lives. God’s grace—that is, the unmerited, unearned love he pours out on us—doesn’t always make itself evident when we think it should, but it certainly is poured out when it can be most effective. At just the right time, we feel that gentle tug inviting us to turn toward him. At just the right time, we are given the opportunity to understand salvation is being offered to us through the simple act of belief. And guess what: If we don’t respond right away, at just the right time we will get another opportunity, and another. God wants us to come back to him. At just the right time, the grace we need to grow as his followers will flow to us. We will find ourselves open, vulnerable, and God will not miss that opportunity to pull us further from sin and closer to him. At just the right time, when we think we cannot bear pain or grief anymore, God will be there, and we through his presence during our suffering will develop a deeper understanding of just how much God cares. Our endurance will grow, our character will grow, and we will be filled with a new hope. At just the right time, we will see God with restored eyes, praise him with perfect voices, hear the angels singing with incredible clarity, and know that everything has been made righteous and holy. Certainly, we will see this in some way at our deaths. Perhaps some of us will see this in a resurrection that precedes our dying. Either way, we are all subject to God’s timing, and we know we can trust him. The featured image is “Christ Enters Jerusalem,” Wilhelm Morgner, 1912. I developed this sermon in the first person—that is, in Job’s voice—while in seminary. For various reasons, I did not preach it in the first person Oct. 4, but the ideas in what is written below were the core of the sermon. I have to say, I’m relieved at how the written version begins. “There was a man in the land of Uz whose name was Job, and that man was blameless and upright, one who feared God and turned away from evil.” It’s good to see that this book affirms my righteousness. A lot of people questioned my character. For a long time, my life was just about perfect. I had a beautiful wife, seven sons and three daughters, and frankly, I was rich beyond belief. I had sheep, camels, oxen and donkeys grazing for as far as the eye could see, and I had servants taking care of them. To my utter bewilderment, it all fell apart on me in a single day. First, thieves made off with my livestock, slaughtering most of my servants in the process. Then, out of nowhere, a great windstorm knocked down my oldest son’s house, crushing to death all my children as they feasted. Not too much later, I began to get sick. I developed these nasty, oozing sores from the the soles of my feet to the top of my head. And folks, that means they were on everything in between, too. I felt like God’s garbage, so I went and sat down on the ash pile. There, at least, I could use a piece of pottery to scrape the festering mess off of myself. That’s when my friends showed up. They did really well at first—they just sat quietly with me for a whole week. I was in misery, but at least I had company. But as soon as I remarked that I wished I had never been born, Eliphaz felt the need to speak up. Then the others joined in. Their arguments were quite elaborate, even poetic, but they all boiled down to this: “Job, you must’ve done something to offend God.” I told them I couldn’t imagine what it might be, but they just went on and on. I should mention one surprise I learned from this book. One of God’s angels, the one known as Satan, “The Accuser,” was the actual cause of my troubles. He thought my righteousness resulted from my easy life, and that he could make me curse God. To be honest, knowing that God let an accusing angel do so much evil to me leaves me even more confused. I suppose I’ll just have to rely on what God told my friends and me: The Creator cannot be fully understood. At least God gave me a new family and restored my wealth in the end. Still, I would like to better understand God. In the midst of my sickness, I did have a vision. I poured out some powerfully strange words, so powerful that I longed for someone to engrave the words in stone. Maybe a fever accompanied the sores—I don’t know. It’s a strange hope to have. Who is this Redeemer? And how could I ever hope to stand in the flesh before God after my body has been destroyed? It all sounds a little crazy. Perhaps as I read the rest of this “Holy Bible,” I’ll find some answers. I developed this sermon in the first person—that is, in Job’s voice—while in seminary. For various reasons, I did not preach it in the first person today, but the ideas in what is written below were the core of the sermon. I also should note that we baptized Alexandra Paige Price this Sunday in response to her profession of faith. Job had a vision; so did Alex, of what her baptism should be like. She was baptized by pouring, an option we have in the United Methodist Church, albeit one seldom selected. Like Job, Alex has faith in her Redeemer, known to us now as Jesus Christ. He will return one day to make the restoration of the world complete. Not too much later, I began to get sick. I developed these nasty, oozing sores from the top of my head to the soles of my feet. And folks, that means they were on everything in between, too. I felt like God’s garbage, so I went and sat down on the ash pile. There, at least, I could use a piece of pottery to scrape the festering mess off of myself.